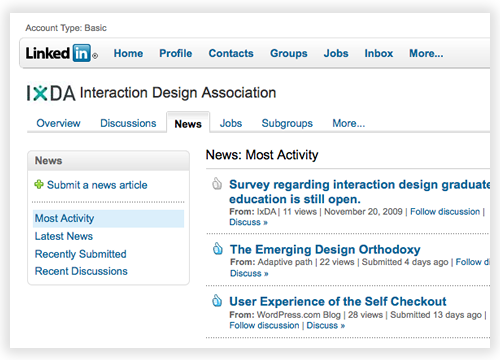 A few weeks ago we announced we were doing limited testing of a new navigation design for LinkedIn. Thanks to all of you who have sent us feedback. We are now in the process of rolling out the new design to all of our users. If you don’t see the change yet, you will sometime in the next week. The first thing you’ll notice in the new design is that there is no persistent left-hand navigation. All global navigation is in the top navigation bar. 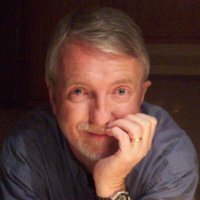 We did this in order to free up space for page content – information about you and your professional network. Another thing you’ll notice is that the new global navigation bar takes up less vertical space. Page content is moved up higher on the page – less scrolling! The global navigation bar is always available and provides convenient access to all LinkedIn services. 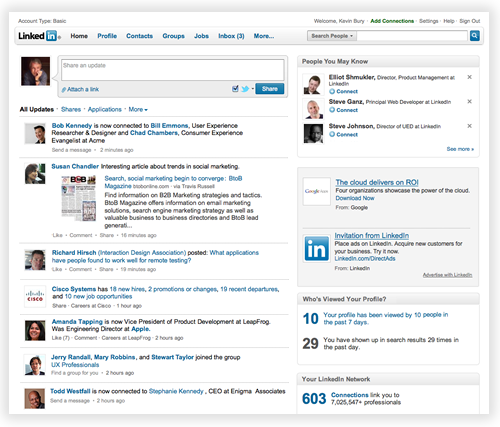 Pass your mouse over the bar and you will see menus that provide quick access to the most popular LinkedIn features. For example, the Groups menu has links for finding and creating groups; it also has quick links for the groups you access the most often. Additional applications and services are available under the More menu. 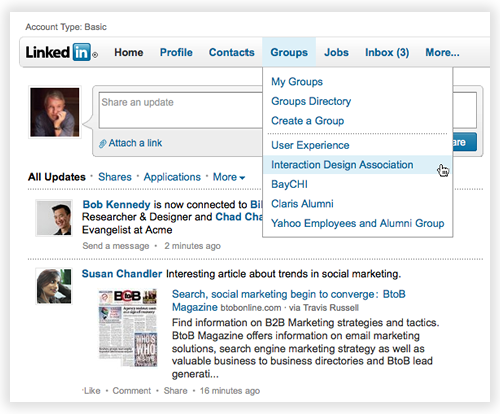 When you are in an area of LinkedIn (such as Contacts or Groups) you see local navigation. The major sub areas are in tabs along the top of the page. If the page allows filtering of content (such as Discussions or Search Results) these options are shown on the left. On some pages, the new navigation can increase the amount of space available for page content by almost a third. In the coming weeks and months, look for continually improved and relevant content to occupy this space. Stay tuned!